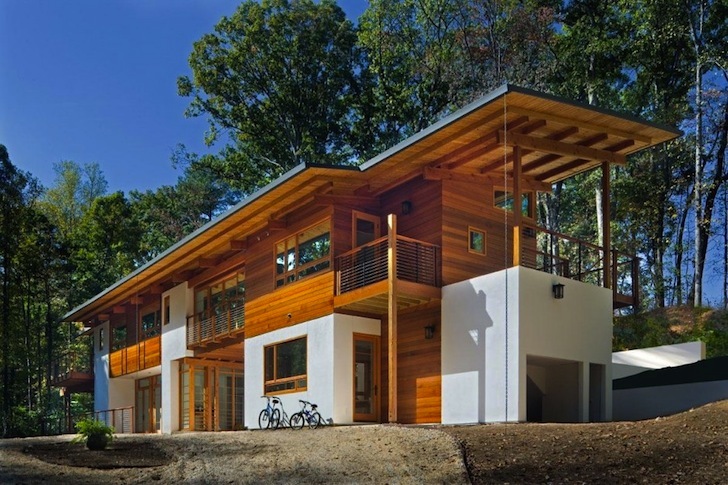 The LEED-seeking Greenland Residence in Georgia is ready for the future. Wired for a rooftop photovoltaic array and set up to charge electric vehicles in the garage, this mammoth private residence is situated on a 1.3 acre lot in Atlanta. Measuring in at a whopping 4,750 square feet, the mini palace is designed to accommodate three generations - like the good old days when families stuck together. Yet it manages to retain a relatively humble footprint. Hit the jump to learn how Studio One Architecture struck the perfect balance between luxury and environmental constraints. 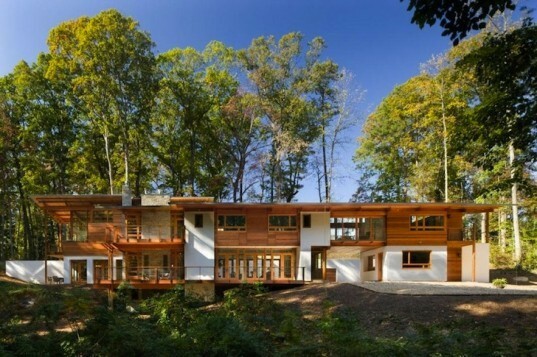 How is it possible to ensure that a home this large has a gentle environmental impact? Studio One shows us how with the charming Greenland Residence. Reached by a long private drive and carefully oriented on an east-west axis, the home has a geothermal system that keeps it warm in winter and cool in summer. Extra efficient glazing provides daylighting while allowing for just enough solar gain to bolster interior temperatures in winter, but deep overhangs keep the inhabitants from roasting during Georgia’s sultry summers. An underground rainwater collector helps to conserve water and all of the home’s appliances are rated for optimum energy efficiency. Solar power is on the agenda, as are electric vehicles, and the LEED certification process is still pending. Albeit really quite large, the exposed Douglas Fir rafters, flooring and cabinetry combined with Yellow pine decking and trim lends a warm aesthetic to the home, which also features a certain amount of recycled content. like this it could be adapted to container construction, as well. Constructed with some recycled materials, the home features exposed Douglas Fir rafters, cabinetry and flooring and some Yellow Pine detailing and trim. Albeit quite enormous, the home maintains a reasonable environmental footprint thanks to a host of conscious design interventions.